Like Zippy Baby? Click here to view the entire range. 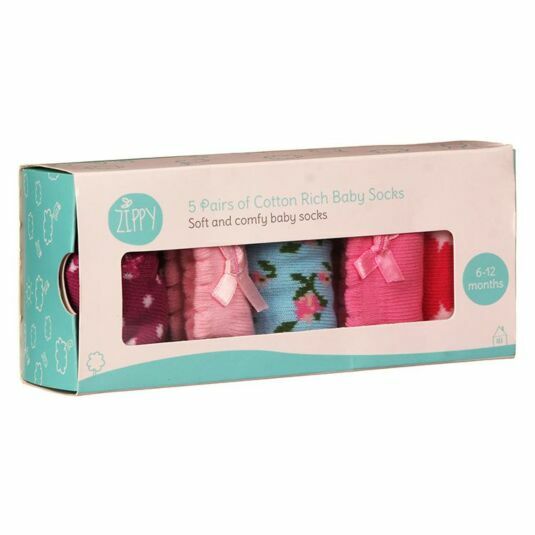 Ensure that children have the best possible start to life with these Zippy Baby girl socks, suitable for 6-12 month olds. They are soft and comfortable, easy to put on, with a ribbed top that keeps them up. With the brilliant anti-slip design on the bottom, they are absolutely ideal for learning to walk. These cotton rich socks are 80% cotton, 18% nylon, and 2% spandex the spandex and nylon, of course, make up the anti-slip grips on the bottom. Comfortable and safe, what could be better? 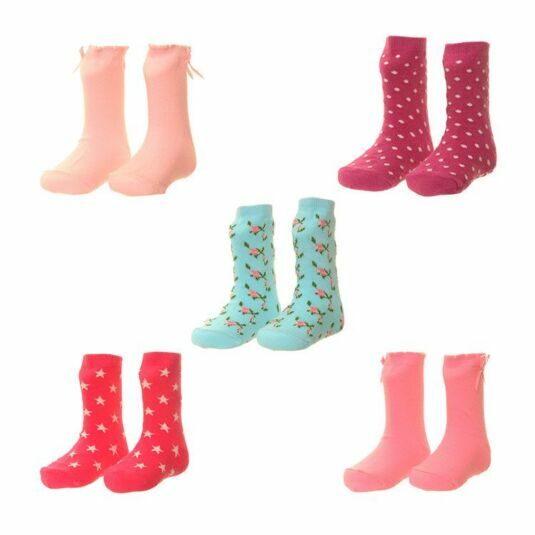 This product contains five pairs of girl socks, in different colours and designs: pink with white stars, pink with a ribbon, light pink with a ribbon, light blue with flowers, and purple with white dots. They look great, but more importantly, they feel great. They make a brilliant gift for anyone you know who has recently ventured into the wild world of having a baby girl; and you think you can help them out by getting their baby girl/girls some comfortable and long-lasting socks to keep them safe and warm! Suitable for Washing Machine: Do not exceed 30°C. Do NOT tumble dry.